Wassup people!!! Do you know what day it is today?! I don't hear you! So? Yeah!! It's 39th annual of the first European punk rock festival! Today everyone and their uncle may feel themselves true punks, yoo-hoo! So we announce the great punk party with greatest prizes! The true punks value only the cash earned in battles and blood-stained. So, starting right now and till 3PM GMT Monday, August 24th, you should rob your enemies! The more cash you loot, the more prizes you can pick! One term: the summary trophy within these 3 days should be no less than 300,000 credits! Earn the cash and you can pick the prizes for this sum (the money won't be taken from you however). - Ring of Power for 30 days: 700,000 credits. All the players who meet the requirements shall be announced at Monday and the prizes shall be handed out within a day since you contact the Administration and give the list of desired prizes. 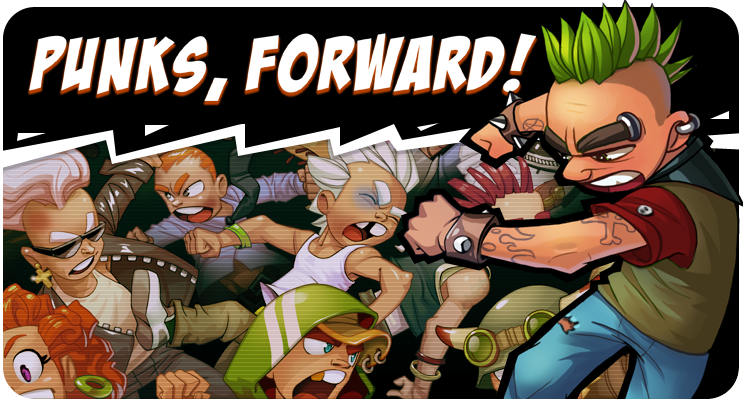 It's time to draw the line under "Punks, forward!" contest. The prizes shall be given out within a day since their letter to support with the list of picked prizes.